Take a little tour inside this contemporary home and uncover some of its unique features. This 4,500+ square-foot home boasts three bedrooms and three and one-half baths. Both the exterior and interior give a nod to the home's rustic mountain setting but also incorporate the family's contemporary style. 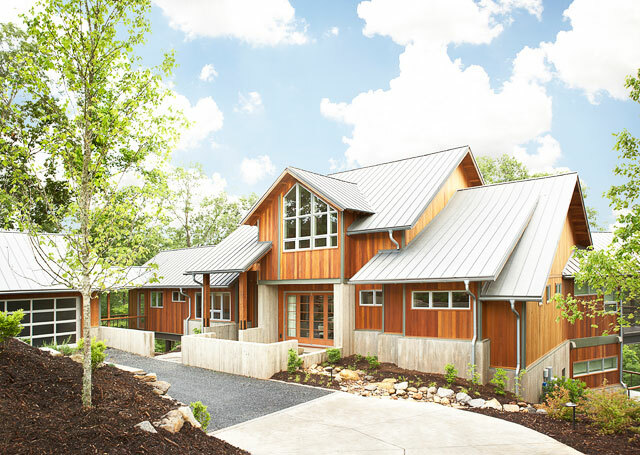 The exterior of the home features groove cedar siding, exposed steel detailing, a standing seam metal roof and granite boulder walls. The exterior color finishes allow the home to blend into its natural surroundings. 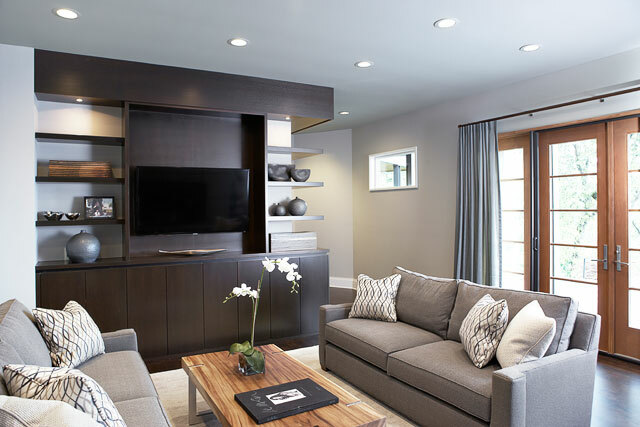 The interior design of this home is refined and modern in an effort to maintain a strong sense of style along with a sense of balance with the environment. The use of a neutral color palette and natural materials, along with a number of green features, help merge sustainable design seamlessly into the upper echelon of mountain living. The expansive low e-aluminum clad windows in the living area not only allow the homeowners to enjoy a gorgeous view but also allow plenty of natural light in, saving on energy. 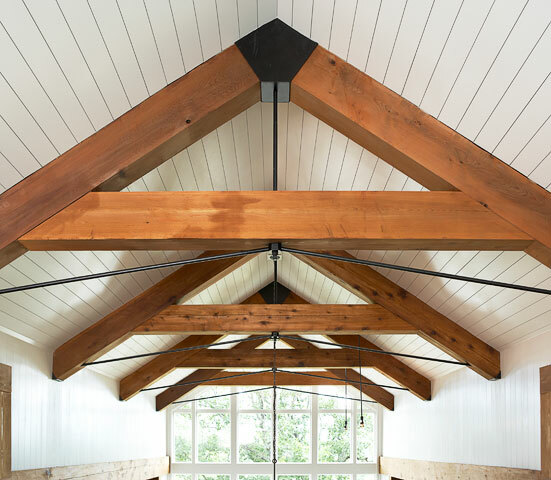 The main entryway ceiling is composed of timber and steel trusses and a T&G ceiling. The sleek lines and woodgrain of the timber beams create a dramatic contrast with the white tongue and groove ceiling, drawing your eye upward and further opening up the space. The expansive kitchen features Ceasarstone and 3-form countertops along with Energy Star appliances and natural and ceramic tile. 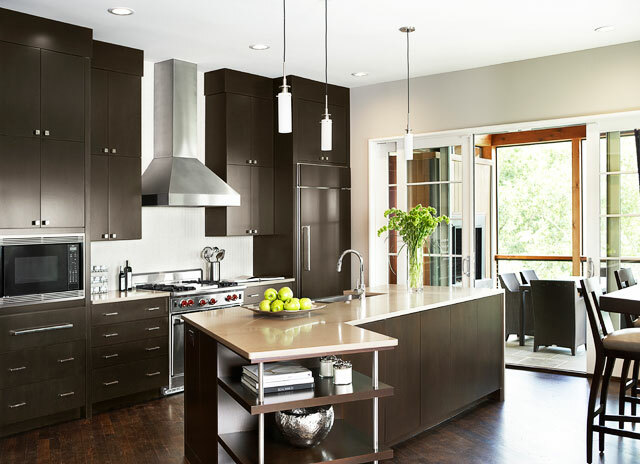 The dark cabinets flow beautifully with the reclaimed flooring stained to a warm, dark brown. 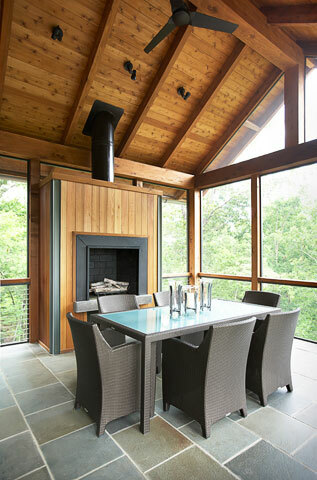 Off of the kitchen is a gorgeous sunroom that makes you feel like you are amidst the nearby treetops but can still feel cozy near the timber-framed fireplace in the winter months. The master bathroom feels calm and serene due to its soothing and neutral color palette. The reclaimed hardwood continues into the bathroom and offers a striking juxtaposition to the ceramic white free standing tub with water heated through solar thermal heating. Their woodland level living room features custom built-ins and a cozy seating area perfect for entertaining or family time. The chamcha wood coffee table gives a nod to the wood finishes used throughout the house and blends beautifully with the color palette. In addition to some of the green features listed above, the home also includes phantom screening, future PV array preparations, low-VOC interior paints and finishes and environmentally preferable product cabinet material that positions the home for the LEED for Homes Gold rating the homeowners are seeking. Want to see more of this project? Visit our Web site to see additional photos from this home within Gary Player Estates at The Cliffs at Mountain Park. Let us know in the comments below what type of project you'd like us to feature next. Looking to build a new home or renovate your current home? Click the button below to contact our design team today.